Tonight on Lifetime, WITCHES OF EAST END continues with another new episode. On tonight’s show, called “Electric Avenue,” Elyse returns to deal with some unfinished business.. Did you watch last week’s premiere episode? We did and we recapped it right here for you. On last week’s episode, Joanna’s immortal attorney, Harrison, prepared for her murder trial. Afraid for Adam’s safety, Ingrid re-evaluated her relationship with him. Penelope recruited Freya to help her mend the rift between Dash and Killian. Wendy seduced an entomologist (Freddie Prinze, Jr.) while trying to gather ingredients for a spell. Joanna and Harrison tried to protect Principal Redmond from the shifter. On tonight’s show Ingrid finds a unique way to mourn for Adam. Joanna and Harrison take their friendship to the next level. Freya meets Dash’s ex fiancée Elyse when she returns to deal with some unfinished business. Tonight’s series premiere is going to be great and you won’t want to miss it. So be sure to tune in for our live coverage of Lifetime’s Witches of East End episode 5 tonight at 10PM EST! 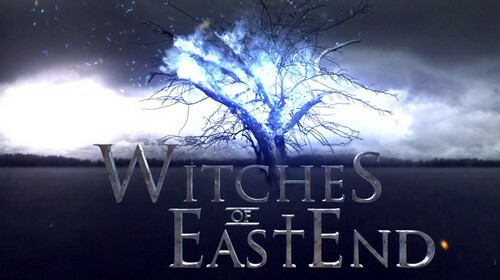 Remember also to bookmark Celeb Dirty Laundry and check back here for our live Witches of East End recaps, reviews, news, and spoilers! The show begins with Ingrid looking out the window, thinking about the moment when Adam died. Wendy comes in and says that perhaps she could go with her to Adam’s funeral, but Ingrid says she’s not going — because she doesn’t want to intrude on his family’s time. Wendy wants to help her mourn, but Ingrid insists on doing it her own way. When she retreats into her room, we see Adam standing there — his ghost? Dash’s mom and Freya find an antique wedding dress and are excited for her to wear it down the aisle. Joanna is drawing in the garden and Harrison arrives, telling her it’s time to go to court. Freya goes into the bar to get her pay and asks a blonde lady if she wants a drink; the lady asks Freya if she’s dating Killian. Freya says no that, in fact, she’s engaged to his brother. The lady introduces herself as Elise, Dash’s prior fiance. Meanwhile, Ingrid is holding Adam in her bedroom. He wants to go to work, but she asks him to stay around. In court, Joanna’s trial is underway. The woman who accused Joanna of murder suddenly can’t remember her initial testimony and says she, actually, can’t remember whether or not she saw the face of her husband’s killer. Apparently, Wendy’s curse (the one she did last episode with the exotic butterfly) is working to protect Joanna. Ingrid says Adam can stay in her room; he insists on getting back to his life. Ingrid finally says that nobody is expecting him for work today because everyone is at his funeral. She tells him that he died three days ago, that he had an aneurysm. Freya continues to be worried about Elise’s sudden return — and she fears that Dash might fall back in love with her. Joanna is cleared of murder because the state has no other witnesses and, since Maura Thatcher forgot her testimony, all charges have been dropped. Joanna thinks it’s quite strange and “quite convenient” that this happened. Adam finally realizes that he’s dead; he goes to his funeral and watches on. We learn that Ingrid summoned Adam’s spirit. Back at the bar, Freya confronts Elise and wonders why she’s in town. Elise storms out of the bar and Freya runs after her. Killian stops Freya and asks her why she’s storming through the bar shouting at no one. Freya says she’s talking to Dash’s ex fiance, but Killian says that someone must be messing with her because Elise is dead. Oh snap. Another ghost. Harrison, Wendy, and Joanna celebrate J’s win — but Joanna can’t help but think that Wendy altered Maura’s memory, an irreversible form of magic that can be quite harmful. Freya opens up to Wendy about ghosts — asks if they’re real. Wendy tells her that ghosts generally don’t stick around the living world but, when they do, they need to be summoned. Wendy realizes that Ingrid probably brought back Adam and Elise piggy-backed on the spell and came back, too. Ingrid wants to stay with Ghost Adam forever. If he doesn’t leave by tonight’s full moon then he’ll be stuck on this plane forever. Joanna and Harrison hook up. Freya goes to the hospital to talk to Dash about Elise’s death. Elise is there listening to the conversation as Dash says that he never loved her as much as Freya. Elise says no worries, that she’s not there for Dash: She came for someone else. Meanwhile, Maura is going crazy. Joanna confronts Wendy about that spell. Freya returns to the bar and asks if there’s been any weird electrical problems — she thinks Elise is coming to kill Killian. If the ghost harnesses enough electrical energy, there’s a possibility it could kill a human. Ingrid and Adam talk about why he’s dead and the fact that his window of opportunity to cross over is closing. He’s not sure if he wants to cross over, but he doesn’t want to force Ingrid to have to focus her life around a ghost. The bar begins to go crazy. Freya tries to reason with Elise — but she says that she’s not leaving until she gets what she wants. She wants to kill Killian and take him with her to the other side. She harnesses a lot of electrical energy. The lights go out. Killian returns to the bar and turns on the light — he gets zapped and falls to the floor. Killian is rushes to the hospital — Dash saves his life. Elise looks on. Joanna and Wendy have a heart to heart talk; Joanna confesses that she slept with Harrison, and Wendy says that she’s sorry for being impulsive but that, when it comes down to saving her family or saving another, she’ll always choose family. Wendy asks if Joanna will help her make it right with Maura. Joanna says she can’t fix it, but she can help make it better. In the hospital, Freya tries to convince Elise to cross over before sunrise. Freya says she can’t force her to cross over but that she can help her. Ingrid finally comes to the realization that the best choice for Adam is to help him cross over. Ingrid informs Adam that, once he leaves, she won’t be able to summon him back, as the spell only works once. Ingrid and Freya both help the ghosts cross over to the other side. Wendy and Joanna help Maura cope with her curse, which is irreversible — they sort of trap her in a lovely vision of her past, one that involves her husband, and they walk away.